Many an argument in America, I’m certain, has ended with the phrase “it’s in the Constitution,” despite the reality that many Americans have never read the document and would be ill-advised to debate what is in — or not in — the Constitution. But one who man could say it with certainty was president James Madison. 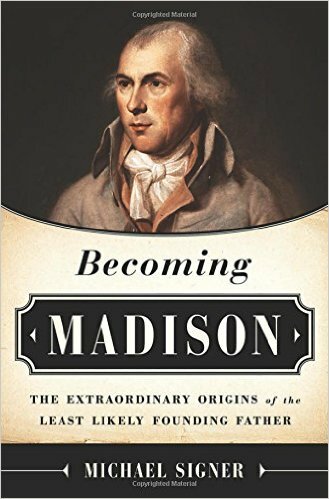 Becoming Madison: The Extraordinary Origins of the Least Likely Founding Father , centers around the younger, formative years of the country’s fourth president and author of the Constitution. Most of the story is neatly sandwiched between two defining moments in Madison’s life and both incidents involve his political nemesis, Patrick Henry. In the first moment, Henry see a great political opportunity in, of all things, the decline of church membership in Virginia. Henry tries to exploit the electorate’s belief that the closing churches indicate the country is heading down the path to Hell, immorality and eventual destruction. The true question was not whether religion was necessary. It was whether religious establishments were necessary for religion. No. Find passion in your conscious. Focus on the idea, not the man. Develop multiple and independent lines of attack. Establish a competitive advantage through preparation. Conquer bad ideas by dividing them. Master your opponent as you master yourself. Push the state to the highest version of itself. The book ends with an even larger political battle with Henry — ratification of the U.S. Constitution. Henry was adamantly opposed to the proposed Constitution — viewing it as the enemy of freedom — and, of course, Henry was considerably influential. In fact, it was assumed in his day that if his home state of Virginia did not ratify the Constitution — then the Constitution would fail to garner the nine states needed for acceptance. In the end, Virginia narrowly ratified the document. Although the focus of the book is on the forces and influences in Madison’s younger years — especially the ones that channeled him into being a statesmen — the book is also filled with enough real life stories to let reader understand who Madison is. Madison, at 5′ 4″ and a 100 or so pounds, probably would not have been elected in today’s TV-driven presidential races where the passions are intentionally enflamed by demagogues. Although by no means perfect, Madison was a believer in a governmental system that kept all the various passions in check so that the good of the nation — and its citizens — would be served. The author points out several of Madison’s weaknesses and the most pressing one was panic attacks. The problem plagued Madison his entire life. As a young man Madison — a believer in armed opposition to the British — collapsed on the battlefield unable to participate in war. At the age of 36, during the ratification process of the Constitution, Madison retreated to his room for days unable to face the controversy. Despite this weakness — which was potentially debilitating in politics — Madison rose above his pain, authored and then fought for the document that governs our nation. Madison was a believer in reason and it nearly costs him his political career. He suffered his first defeat by refusing to participate in a common practice of securing votes. Most politicians in his day would supply voters with alcohol on election day and, of course, the drunker the voters became the more apt they were to cast their ballot in favor of the one supplying the alcohol. Madison felt the practice demeaned the nation, believing that those who govern had a moral obligation to be statesmen and push the state to the highest version of itself. In a book review it is not possible to explore all the reasons a book is worth reading and the list of childhood influences and educational choices are just two subjects the book explores that I have not touched on. But, the fact that Madison was educated under the tutelage of John Witherspoon was extremely influential in the creation of the U.S. Constitution. It was while being pushed, educated and challenged by Witherspoon that many of the ideas in the Constitution first surfaced. Rated 5 out of 5. Before reading the book all I knew about Madison was he authored the Constitution and I was pretty sure he married Dolley. After that I knew little about the man. After reading the book though, I must say, my impression of Madison is he was a man of principle and believed that for a country to succeed, strong checks must be in place to counteract voters’ passions. His main weakness, I would contend, was he put too much faith in the morality of elected officials, presuming they would govern from a sense of morality and the higher good.